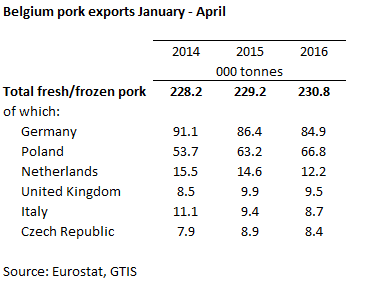 BELGIUM - In the first four months of 2016, Belgium exported 231,000 tonnes of pork. This was virtually stable on the same period a year earlier, up less than 1 per cent. However, the value of these exports fell by 6 per cent over the same period, to €354.4 million, as a result of the price of Belgian exports falling by just under 7 per cent. Fellow EU Member States are the main recipients of Belgian pork, accounting for almost 93 per cent of shipments. Exports to third countries have risen, albeit very modestly. While the Belgian authorities signed an export deal with China in 2015, there still only remains a limited number of companies that are accredited to export to China. Further inspections are scheduled that, if successful, could accredit more companies for Chinese export. Germany remained the main destination for Belgian pork, accounting for over a third of all shipments. However, these were back just under 2 per cent on the same period a year earlier. This was somewhat offset by a rise in exports to Poland, by 6 per cent. These two markets dominate Belgian exports, accounting for two thirds of the market. The smaller markets, predominantly other EU Member States, all recorded falls in exports, most notably the Netherlands, which was down 16 per cent.